Pacemaker Press Belfast 12-02-2018: 'Three people have been injured in a stabbing incident in a County Armagh cemetery. 'Picture By: Arthur Allison. 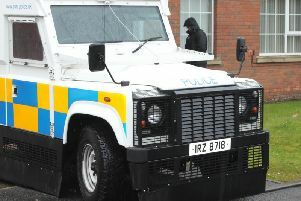 Three people have been stabbed in a large-scale “disturbance” following a funeral in Lurgan. The PSNI attended what they described as “a disturbance in the North Circular Road area of Lurgan involving a large number of people”. A man, 23, has been arrested and is now in custody, police have said. Sinn Féin MLA John O’Dowd, appealing for calm, said the incident had happened after a funeral. The Northern Ireland Ambulance Service (NIAS) also attended the scene, alongside the air ambulance. An NIAS spokesman said three people were taken to hospital with lacerations. None of the injuries are thought to be life threatening. Police said they were dealing with a disturbance involving a large number of people. A Northern Ireland Ambulance Service spokesperson said, “The Northern Ireland Ambulance Service received a call from the PSNI at 15:39 (3.39pm) this afternoon to report a stabbing incident at the cemetery near North Circular Road, Lurgan. “Three A&E crews, one RRV, one Paramedic Officer and one BASICS Doctor were dispatched to the scene. The Air Ambulance was also in attendance. Sinn Féin MLA John O’Dowd said: “I want to first of all condemn the multiple stabbings. Three people are currently being treated for their injuries at Craigavon Area Hospital. That is absolutely unacceptable but the fact that this was at a funeral is all the more concerning. He added: “I also want to appeal for calm as emergency services at the scene work to bring the situation under control. People should avoid the North Circular Road area.